PERFECT HARMONY: Maitoumbi in action leading festival-goers at last year's Harmony Festival. And the Trees. 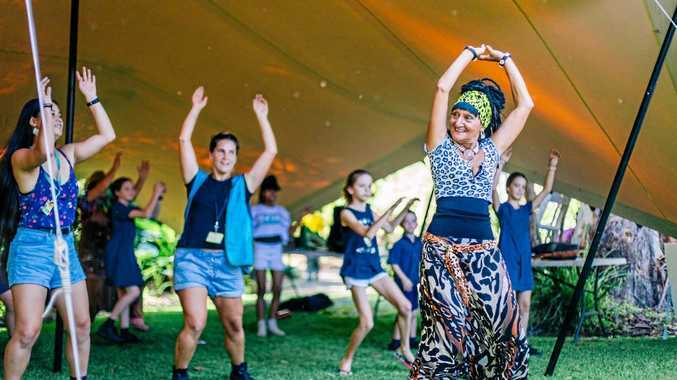 THE theme of the 13th annual Harmony Festival celebrates everyone's journey to calling Coffs home, and few would have a more interesting journey than Maitoumbi. Maitoumbi, who started life as Rebecca, wowed audiences at last year's festival with her Afro Cardio workshop. She will be back again at the Coffs Harbour Botanic Gardens on March 31 for this year's event. "I love this festival," said the woman who lives by the mantra "life is a beautiful rhythm". And no wonder. Maitoumbi, who is a self-declared "senior citizen", is almost an embodiment of the festival - a free spirit who loves music, travelling and experiencing new cultures. Along with the region's finest cultural performance groups and world music acts, this year's Harmony Festival takes an even more adventurous twist, with two exciting new zones added and a spotlight on amazing, delectable, locally produced cultural food. For Maitoumbi - whose name was given to her in West Africa after she navigated a boat there and means "shine like a star" or "coming from the stars" - this multicultural festival is an extension of the way she lives her life. Her parents came to Australia after WWII from war-ravaged Malta. "My mum was pregnant when she left her home country of Malta - mum was North African and dad was Maltese," she said. "My mother found out she was pregnant after the war and I was the baby of hope." Leaving war-torn Europe, the family eventually found themselves in Australia, with Maitoumbi born in the port of Melbourne as their boat arrived. She has been travelling the world on boats ever since, working as a navigator, navigating by the stars until an accident in the Reunion Islands which saw her fall down a cliff and damage her back. This fall led her to a change in career and lifestyle. Helped by a Guinean in her recovery, she discovered a spiritual and musical calling. Now she runs Afro Cardio classes at the Girl Guide Hall in Coffs Harbour featuring music from West Africa and is hoping to offer a gentler version in local nursing homes for the older population soon. Maitoumbi will be just one of the attractions at this year's festival, which also includes plenty of food with cooking demonstrations and a cross-cultural cook-off. There will be performances from all around the world on the main stage. The Beats and Feets dance tent offers plenty of action, while The Melting Pot area is an artistic space created to allow festival-goers to experience different cultures close up and to celebrate Aussie surf culture. The non-stop action all comes to a massive culmination at 2pm with the drumming in of the community parade led by traditional Gumbaynggirr dancers. Join the procession with over 50 samba drummers or just soak up the spectacle of the parade through the festival grounds to the main stage climax with a gigantic cross-cultural dance-off and explosive colour run. Come and uncover your common ground on Sunday, March 31 from 9.30am-2.30pm at Coffs Harbour Botanic Gardens.